Baileys Jewellery is a family business set up by Mark and Demetra Bailey in 1985 with a shop in Horsell, Surrey and, subsequently, a branch in Staines. They are a very specialised business designing, altering, repairing and restoring fine jewellery. Brian Armstrong, who has been with them now for over 20 years, runs their Staines branch on Clarence Street, just across from the old Market Square. It is a small shop on the ground floor of an old building, believed originally to have been a hotel over a hundred and fifty years ago. Clarence Street has been developed over the years and is now two lanes each side of a raised central reservation. Each time the road and surrounding area has been redeveloped, its height has been raised and there is now a steep camber angled down towards the shop front. This can be quite easily seen in the photo taken out through the glass front door of the shop. There has been a gradual increase in ground level outside, typical of a lot of sequential development over many years and, in this case, it can be illustrated by the fact that there is a cellar underneath the shop with a bay-window which is now completely buried underneath the modern pavement. Brian’s flooding problems started over 10 years ago with the latest road ‘improvements’ which managed to reduce the total amount of working curb-side drainage with the result that any heavy rain would leave water pooling at the curb-side immediately outside the shop. Motorists who then drove through that water would cause it to spill over onto the pavement where it would immediately run straight into the shop as the recently increased height of the pavement left the shop door with no sill. “If this wasn’t bad enough, water entering the shop would then leak down into the basement which is actually a storage area for another occupant within the building and has very limited air circulation to aid any drying out. The whole scenario was really intolerable.” said Brian. It was then that Mark and Brian discovered our Floodgates and, with only the slightest modification to the front door of the shop in the form of small hardwood battens to provide a level surface for the Floodgate, the problem was solved. 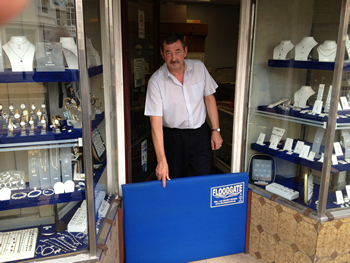 Over the last ten years, Brian has been regularly deploying his Floodgate whenever it looks as though it might rain – especially when closing up the shop at the end of the day where it sits behind the roller shutter security door and, in all that time, they have been fully protected.